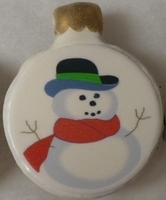 Our Simply Divine Snowman Ornament is handcut from our Simply Divine brownie base, double dipped in fine white chocolate, imprinted with a digital image, dusted with pearl luster and finished with a 24 carat edible food luster cap. Each ornament is individually packaged in a clear, cellophane bag and tied off with a ribbon...a great stocking stuffer. Decoration: Fine white chocolate, froting sheet, edible food luster.